A wide range of research activities have arisen to support the Danish target of a 100% renewable energy system by 2050. Projects focused on individual aspects of the energy system, such as zero emissions buildings or intelligent power systems provide valuable insight, but overlook the efficiency, cost and emissions savings possible with an integrated approach that facilitates flexibility throughout the energy system. CITIES will address this deficiency by establishing an integrated research centre covering all aspects of the energy system, including gas, power, district heating/cooling and biomass, and most importantly methods to forecast, control and optimize their interactions through the use of advanced ICT solutions. The high densities of population, energy consumption, and energy and communications networks in cities offer the greatest potential for flexibility at the last cost, and the fact that cities account for 80% of global energy consumption and emissions make the urban environment an ideal setting for energy systems integration research. 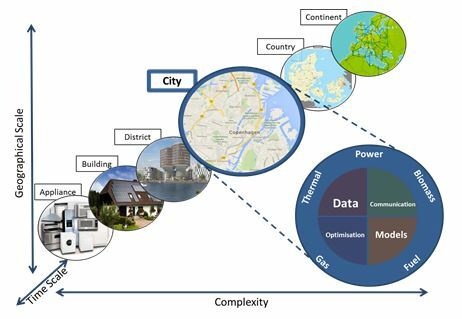 CITIES will pioneer research into fully integrated city energy systems, building short-term operational models that feed longer term planning models, considering the spatiotemporal variations, interactions, dynamics and stochastics in the energy system. Low level models of system components will inform higher-level aggregate models employed in market and control framework design. The leading position of European academia and industry and the rapidly growing market for smart energy solutions indicates substantial scope for increased competitiveness and job creation within this field. CITIES will, in collaboration with its industrial and academic partners, conduct research with a view to developing tools for the implementation of integrated energy system solutions. The societal objective of CITIES is to establish a realistic and concrete pathway to ultimately achieving independence from fossil fuels by harnessing the latent flexibility of the energy system through intelligence, integration, and planning, focusing on city environments and working towards both 2020 and 2050 European and Danish goals. The scientific objective of CITIES is to develop methodologies and ICT solutions for the analysis, operation and development of fully integrated urban energy systems. A holistic research approach will be developed that aims to provide solutions at all levels between the appliance and the total system, and at all time scales between operations and planning. The educational objective of CITIES is to educate a generation of academics, engineers and entrepreneurs on the value sand necessity of considering the energy system as a whole in a collaborative, integrated context, rather than focusing on a single facet or component. The commercial perspective of CITIES is to identify and establish solutions which can form the background for commercial opportunities within the smart cities environment, and to support the development of these and other smart cities demonstration projects, including through a range of decision support tools to be developed as a result of our research efforts. Integration of short-term operational models in models for long-term planning. Models of energy consumption and production accounting for their stochastic and dynamic features. Methods for controlling energy consumption and demand side management. CITIES is aiming at being a leading knowledge centre for Smart Cities development and operational tools. The Centre is supported by Innovation Fund Denmark (formerly by the Danish Strategic Research Council).